Bel Aire Bridals, style 6700: Capture the elegance of nature with this sweet floral halo. This vintage inspired piece triumphs with metallic flowers and sensational rhinestones. You will love having this wedding keepsake to pass down to future generations of the family. Available colors: Silver, Gold. When we say New York Bride & Groom of Raleigh, the Triangle’s premier wedding salon, is your one-stop shop for your entire wedding party, we mean it. We even have you covered when it comes to beautiful wedding accessories, which are a huge part of expressing your individual style and completing your bridal look. 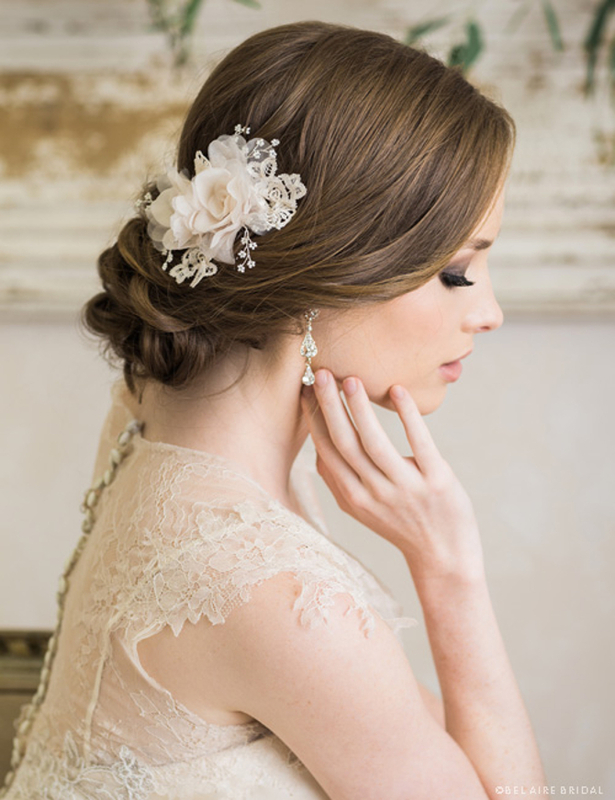 Our team of experienced bridal consultants are always here to help you complete your ensemble from head to toe. “Not everything has to match,” says Mr Bolton. Of course, you don’t want to clash eras and colours, but a beautiful heirloom piece, borrowed or gifted from a relative, could look wonderful alongside a contemporary classic. And if you have a favourite pair of pearl earrings that always make you feel your best, by all means wear them. Even better if they complement the beading in your gown; consider choosing a modern tiara which also has pearl beading detail to really make the most of them and create a cohesive overall look. “Sometimes less is more,” says Mr Bolton: just because you can wear a veil, tiara, earrings, necklace and more, it doesn’t mean you should. To err on the safe side, choose the traditional earrings and bracelet bridal combination. And opt for either gold or silver for your accessories, but not both. Bel Aire Bridals, style 6718: Soft romance emanates from this delicate organza rose. Crochet lace and beaded sprigs and pearls create a dreamy magnetism that pulls your bridal ensemble together perfectly. Available colors: Ivory, Champagne. Bel Aire Bridals, style 6500: Sparkle and shine as you glide down the aisle wearing this radiant filigree and rhinestone halo. Shimmering links highlight every hair color and complement numerous dress styles. Incorporate into an up-do or keep your locks down and flowing — it all works with this gorgeous piece. Available colors: Rose Gold, Gold or Silver. Talk to your hairdresser/hairstylist prior to your wedding about the best accessory for you and your hairstyle and type. If you are seeking a meaningful keepsake for your best ladies, consider gifting them with an accessory. This way, they have something new and beautiful to wear on your big day and they also have a lovely piece to enjoy for years to come. New York Bride & Groom of Raleigh has a selection of designer wedding dresses, bridesmaid dresses, rental tuxedos and accessories that is unmatched in the Triangle region. Come browse our 17,000 sq.ft. modern luxury salon at your convenience (no appointment needed) and let our bridal consultants help you assemble your perfect wedding day ensemble and outfit your entire wedding party.